A natural Arthritis supplement for healthier joints, free from pain, stiffness and inflammation. Regain your freedom of movement to regain an active, healthier and happier life. 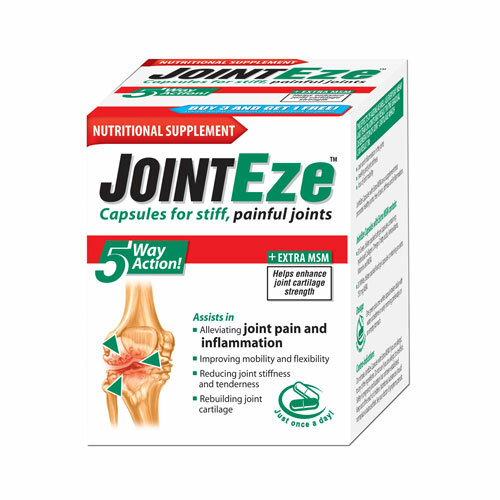 JointEze Capsules Plus MSM are an amazing natural supplement promoting healthy joints, free of pain, stiffness and inflammation. 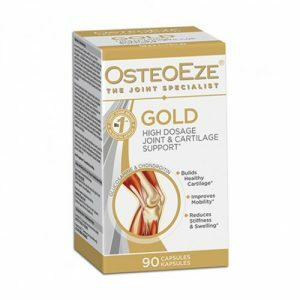 JointEze Capsules Plus MSM have a 5-way action, providing the appropriate balance between Hydrolised Collagen, Omega-3 fatty acids, Antioxidants, Vitamins and MSM; combined to assist in alleviating joint pain and inflammation while helping enhance joint cartilage strength. – 30 Green, blister packed soft gel capsules containing Hydrolised Collagen, Omega-3 fatty acids, Antioxidants, Vitamins and MSM. – 30 White, blister packed hard gel capsules containing an extra 750mg MSM. Benefits can be felt after 30 days of continuous use. Omega-3 fish oil 300mg, Grape Seed Extract 200mg, Vitamin C 60mg, MSM 150mg, Green Tea Extract 25mg, Lecithin 25mg, Zinc 15mg, Vitamin E 15mg, Hydrolised Collagen 10mg, Selenium 0.02mg. Soybean oil, Beeswax, Gelatin, Titanium Dioxide, Chlorophyllin Copper complex, Purified Water.